The main sponsor behind Brora Rangers, who have just won their first ever Highland League title, says he is planning to help the club dominate the competition for years to come. Businessman Ben MacKay flew in from Singapore to join hundreds of other Brora fans who travelled to Banffshire on Saturday to see their side defeat Keith 3-0 and clinch the championship. His investment has helped Brora to build up an impressive squad that includes former top-flight players Ross Tokely, Grant Munro, Richie Hart, Joe Malin and Zander Sutherland. They have swept all before them, establishing a 17-point lead over second-top Nairn County and scoring 109 goals in only 30 games while conceding just 13. 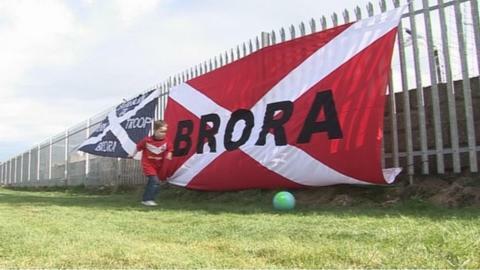 For MacKay, it was a dream come true to see Brora clinch their first Highland League title since joining the division in 1962. Speaking after the game on Saturday, he said it had been an "absolutely unbelievable journey with the supporters and the club over the past two years". "We have a village of 1,200 or 1,300 people and I reckon probably 70% of them were here today," he explained. "Phenomenal support for the football club. It was absolutely unbelievable." He was quick to dismiss suggestions that Brora had bought an unfair advantage. "We've had a bit of talk in the press about money, but I've watched the Highland League be won probably 25 out of the last 30 years by Aberdeenshire clubs that have spent loads of money and they don't seem to like it when a team from the north can respond," said MacKay. "I think there is a bit of jealousy in the Highland League and I am proud and humble to be part of a team and a club that could offer a response to the Aberdeenshire clubs. "To be frank, there are one or two clubs in the north who have had those resources and probably wasted them." Former Inverness Caledonian Thistle and Ross County defender Tokely is one of those who have joined MacKay's Highland League revolution. The 35-year-old said: "I just came here to get the club on the map and help them be successful. "At this stage in my career, I just want to win things. It's a tremendous feeling just seeing so many faces so delighted. "The Highland League is definitely getting a lot better. Players are maybe stepping down into it and making it a better league and the younger lads are learning, so I think you'll definitely see an even better league in the next four or five years. "Other teams will strengthen in the summer, so we'll have to keep ourselves on our toes and improve as well." However, MacKay is determined to stay ahead of the pack, in part through continuing to build close links with senior sides like County and Caley Thistle, taking some of their youth players on loan. The businessman said: "We have a lot of young guys with us who have got the potential to kick on and I think we have got a club that is giving them the ability to kick on." MacKay is also keen to organise high-profile pre-season matches. Last year, Rangers came calling. However, it's not long since south of Scotland club Gretna had their spectacular rise and equally spectacular fall after stepping up to the senior ranks and MacKay is not wanting to go down that road when the Highland League becomes a feeder for the Scottish Professional Football League's ranks. "Sorry to tell the Highland League - we're not going anywhere," he said. "We've got the pyramid system now - we have to deal with it. "If it happens, it happens - we would never ever throw a game - but my preference is for Brora to go nowhere. "I would like to do with Brora Rangers what happened with Huntly Football Club [in the 1990s] and dominate the Highland League. "Nothing would give me more pleasure than that."